Stocks were rocking and rolling on Thursday, with all three major U.S. indices putting up big gains on the day. After Wednesday’s Fed news, that’s no surprise. Let’s get a look at some of today’s big movers with our must-see stock trades. 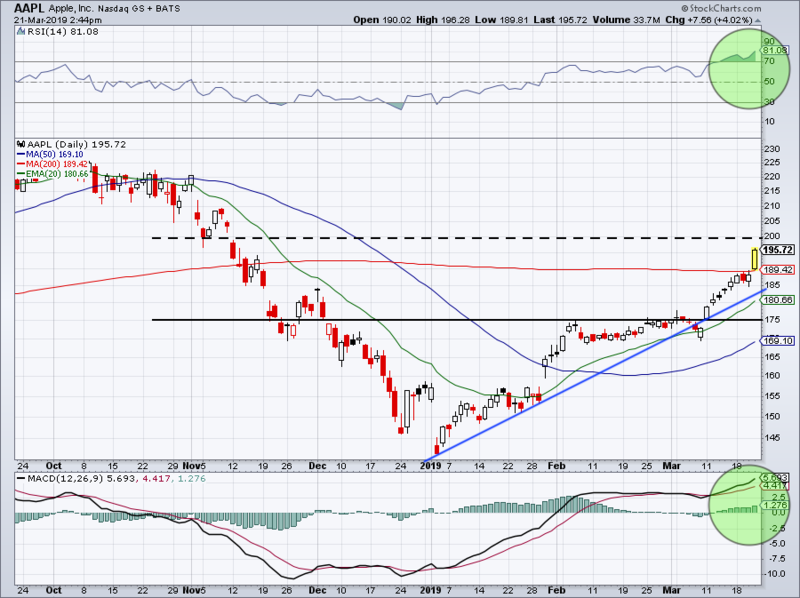 Earlier this month we outlined the long trade in Apple (NASDAQ:AAPL). Then earlier this week, we said investors should consider locking in some profits after the stock’s monster move. Now AAPL is erupting more than 4% on Thursday as the longs keep on cashing in. $200 becomes an obvious magnet, even as its RSI and MACD (green circles) continue into extended territory. This setup does not favor new long positions, but the recent strength does give us a solid buy-the-dips setup going forward. If you’re still long, consider trailing up those stops and locking in some gains. Guess? (NYSE:GES) picked a pretty interesting time to report earnings, with the worse-than-expected results coming on the evening before Levi (NYSE:LEVI) went public. The latter is up more than 30% on the day as investors gobble up the new IPO. 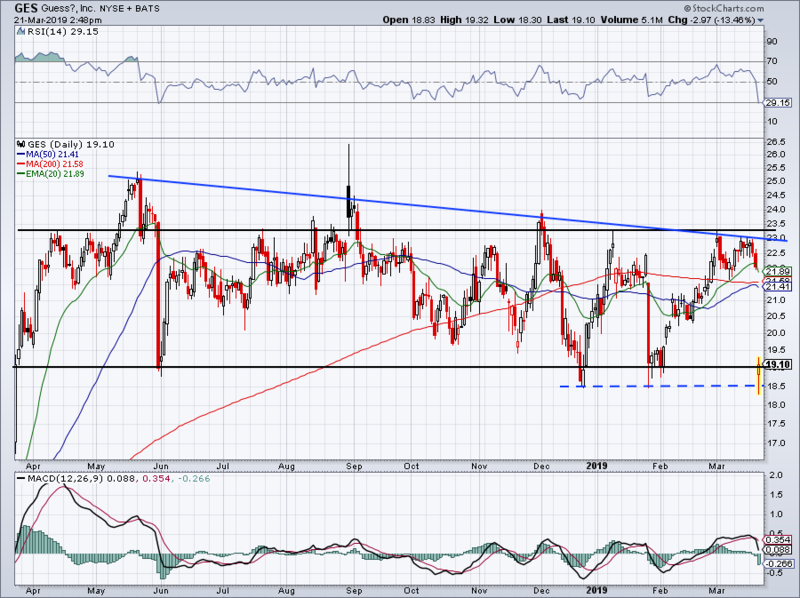 On the plus side, GES stock is clinging to range support near $19. This level has been vital over the past 12 months. There are better buys out there than GES, but investors who feel compelled to go long can use Thursday’s low as their stop-loss. 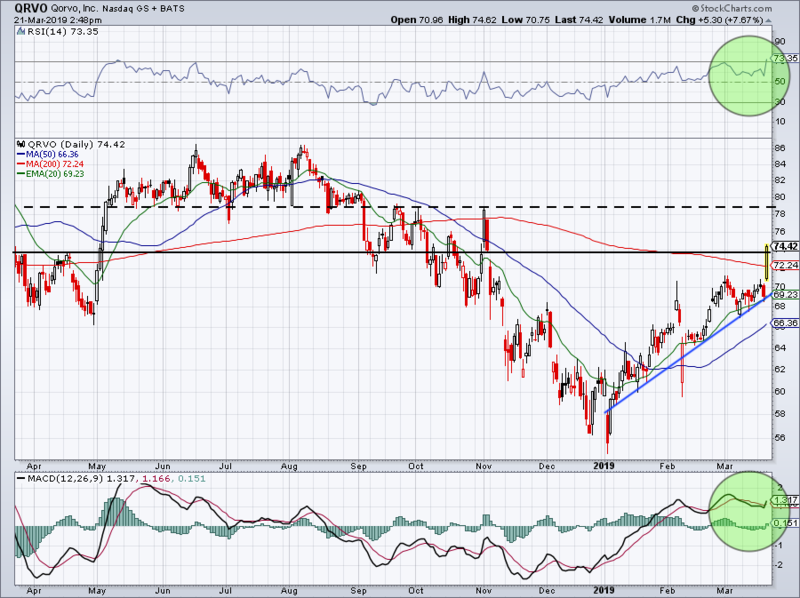 Ventas (NYSE:VTR) isn’t necessarily the top stock to focus on, but its price action gives us opportunity. On Wednesday we talked about how the Fed gave bulls the green light, saying it’s essentially on hold this year when it comes to rate hikes. Well, that bodes incredibly well for dividend stocks and REITs. There’s a reason why names like AT&T (NYSE:T), VTR, Realty Income (NYSE:O), Digital Realty (NYSE:DLR) and others are surging on the day. Look to see if these names can give us some follow through on Friday and into next week. (Here’s the setup on AT&T). For VTR specifically, it held uptrend support and is back over the 20-day and 50-day moving averages. Look to see if it can get to and breakout over $65. Shares of Qorvo (NASDAQ:QRVO) erupted more than 7% on Thursday thanks to an upgrade from Goldman Sachs. 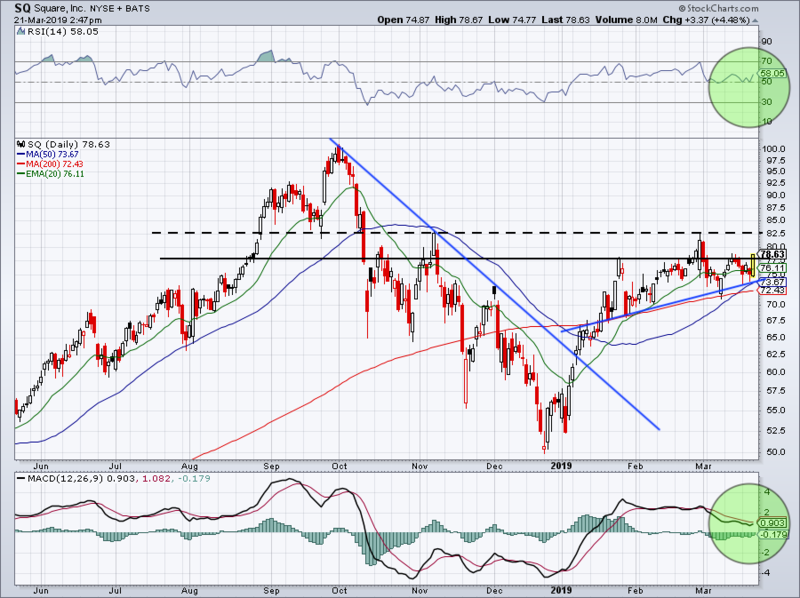 But an earnings beat from Micron (NASDAQ:MU) and continued strong price action from Advanced Micro Devices (NASDAQ:AMD) (trade layout here) and Nvidia (NASDAQ:NVDA) (trade layout here) certainly helps. The move up through $74 is significant. Not only has this level played a notable role in the past, but it’s the 61.8% Fibonacci retracement for the 52-week range. Maintaining this level paves the way to $78. Should QRVO fail to hold this level, it would be encouraging to see it hold the 200-day as support. Bulls shouldn’t let Qorvo get below the 20-day and uptrend support. 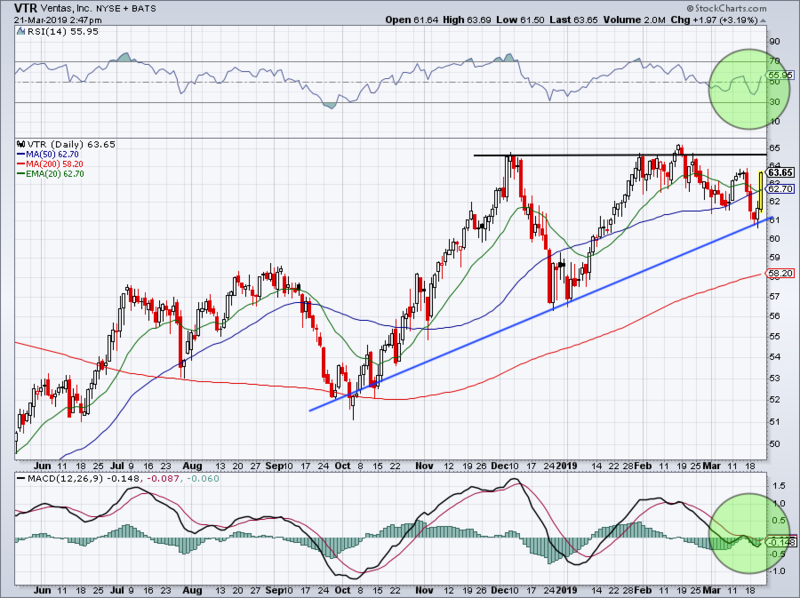 There’s still room to rally according to the MACD and RSI, despite Thursday’s big move. 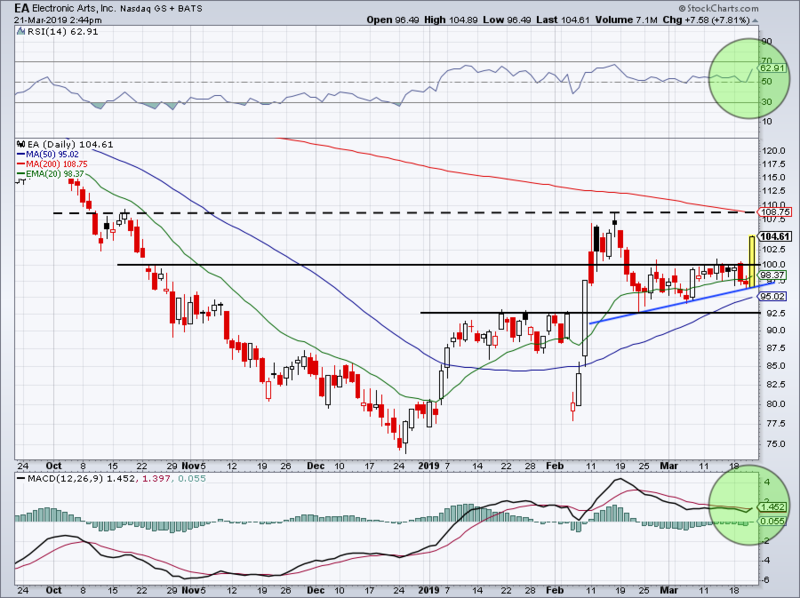 Trending higher and peeking through resistance is Square (NYSE:SQ). The move puts SQ over the 20-day moving average and if it can close over $78, it opens up the possibility of a move to $82.50. This name tends to be volatile, but over the 200-day and SQ stock is fine. Admittedly that’s a wide range from current levels but the RSI and MACD still leave plenty of room for the stock to rally. Let’s do one more really quick with Electronic Arts (NASDAQ:EA). Up 7.5% on the day and it’s breaking out of its recent range in a big way. I want to see EA stay over $100 now. My upside target is $108. Bret Kenwell is the manager and author of Future Blue Chips and is on Twitter @BretKenwell. As of this writing, Bret Kenwell is long AAPL, VTR, O, DLR and SQ. Article printed from InvestorPlace Media, https://investorplace.com/2019/03/5-must-see-stock-trades-aapl-qrvo-ges-sq-ea-vtr/.